The cast-on stitch is a dimensional embroidery stitch. It sits up off the fabric, creating a textures stitch that works well for flower petals and for anywhere that you want clusters of texture on your embroidery. Cast-on stitch is widely used in Brazilian Embroidery, which is a very textured embroidery that focuses on floral designs. But no matter what type of embroidery you like to do, the cast-on stitch works brilliantly for adding dimension and texture. It’s definitely worth learning! In the video, I’m working with a #8 perle cotton, using a milliner needle. Using a milliner needle is really important when working these stitches that require the needle to pass through many wraps (like the bullion knot). The eye and the shaft of the milliner needle are the same size, which makes it much easier for the eye to pass through the wraps. Here’s the video! I hope you find it useful! You can find a Stitch Play Printable with step-by-step photo instructions for cast-on stitch and double cast-on stitch, along with instructions to create four beautiful dimensional flowers, available in my shop, if you’re interested in taking this stitch a little farther! You can find a wide variety of embroidery how-to videos here on Needle ‘n Thread, if you’re looking for other stitches to try out. Feel free to peruse them all! What size Milliner needle did you use? Well, the technique is easy enough, especially if a person has done any knitting in their lifetime. It is just like casting on when starting a knitting project. But the example you gave lies flat and seems very thin. The petals are curved (I think I have that figured out) but the cast on stitches seem longer/thicker from top to bottom, like the difference between a single crochet and a treble crochet (now I’m really mixing things up). How did you make the petals look thicker? I understand how this really interesting stitch works, but I don’t understand how you get from there to the petals of the flower. Regardeing millner’s needle size — Ahem!!! Where’s that Needle ID card????!!! PS – This is one of my favorite “texture” stitches! Hi Mary. Thank you for the videos, they’re so helpful. I do have a question though, how do you get the petals made on the flower? 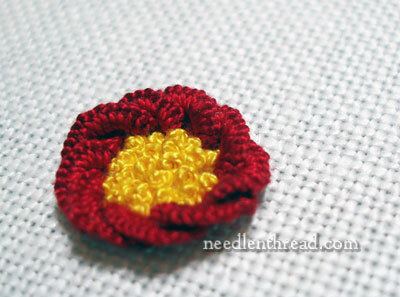 The stitch looks easy enough, but could you demonstrate how you go from the stitch to the flower? Thanks!! Hi, Cyndy and everyone – tomorrow’s post will clarify how to build a flower with cast on stitches. I wanted to get the video for the stitch up beforehand. Look for it tomorrow! Mary. I love your videos. A real help for Thoes who are “how to iliterate “. Watching you demonstrate a stitch is so much better than book pictures and instructions. I sure would like instructions for the flower you made with the cast on stitch. Thanks for making stitches easy for me. From a stumpy (stumpwork) perspective, I think of the various applications of cup stitch and think … oooo – could make variations of motifs using cast-on stitch instead. Thanks! I just recently learned how to do this stitch for a Brazilian embroidery project. What a great use of this stitch! I’ m looking forward to seeing how you make the flower. Thank you for this one. Awhile back I bought a bunch of Brazillion Embroidery stuff plus some extra long needles. One I believe is five inches long! Haven’t pulled it out yet since I have a few older projects in line before I pick up the Brazillion embroidery projects. Thank you, and I look forward to watching you create the flower for us using this stitch! Great post and video the stitch is very similar to the bullion stitch. 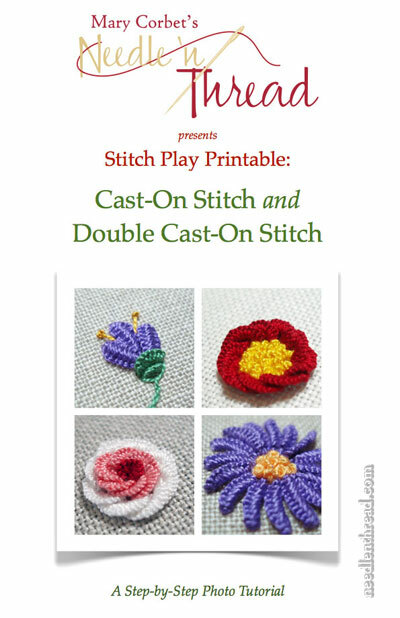 Can’t wait for today’s article on the how to complete a petal using the cast on stitch. Thanks Mary for your time and efforts that you put into these videos. thanks for the video. i had been doing this stitch with 2 needles…never thinking about using my finger. this is much easier. i love it. Brazilian Embroidery Where I can ge this catalog and learn the basic. I really love it even the dimension embroidery. Please replay to me if you have any store I can go in Baton Rouge. Hi Mary, I love the Cast-on stitch. But HOW do you keep it from twisting up on you? After about 3 Cast on stitches my thread starts twisting. Should I just use a smaller thread or stop when the twisting starts? Hi,All your videos give a clear picture of every stitch.can u pls teach me how to do a detached bullion stitch.i am a beginner for Brazilian embroidery. I need help. The directions say I need to do knotted double cast on stitches. Ok I can do that. It is the rest of the instructions that are driving me batty. Here they are: 20 casts on each side however the number of wraps will vary as you go. The first 4 casts are wrapped 5 times,then amke 3 casts with 4 wraps, 5 casts with 3 wraps, 3 casts with 2 wraps and the last 5 casts are not wrapped, regular cast on. Yikes!!! Help! Hi, Vi – I read it this way (if I am misinterpreting, let me know! ): You’re making a double cast on stitch “something” – I’m assuming a leaf or petal. The whole petal is going to be a total of 20 casts on each side of the needle, which means there are 40 casts total on the needle. The petal is supposed to turn out a little chunkier at the base (where the casts are wrapped 5 times, and then 4 times, and then 3, then 2 times). So, if you understand how the knotted cast on stitch or knotted double cast on stitch works, you know that before you cast onto the needle, you twist the loop several times, and then you wrap the loop around the needle, and then cast it on, and when you cast it on and tighten up the thread, a knot will form at the outside edge of the cast. How many times you wrap the loop around the needle before casting on will determine the size of the knot, more or less. So, this is what they’re telling you to do: On your first four casts, for each cast, wrap the twisted loop around the needle five times, then cast it onto the needle and pull through to make the knot. Do that back and forth on each side of the needle (since it’s a double cast-on stitch, you’re forming the same thing on both sides of the needle). Then, with the next three casts, for each cast, twist the loop and wrap it four times around the needle and cast it on, then tighten it up. Assumably, this will make a slightly smaller knot then the previous casts with five wraps around the needle before casting. Then, with the next five casts, do three wraps around the needle, then do three casts with 2 wraps and then, the last five casts are just regular cast on stitch, without any knot, so there are no wraps. I hope you have a nice long milliner needle for this – depending on the weight of the thread, 40 casts (20 on each side) can be difficult to fit on a needle! I hope that helps a little bit. I haven’t covered knotted cast on stitch, but I probably should – it’s a fun stitch, once you get going with it! The difficulty is that it tends to look messy if the twists and wraps are not pulled just right. You want to make sure that as you pull the thread through after casting on, you do it slowly enough to ease the cast into place on the needle and to pull in the extra thread between the casts, so you don’t end up with an extra noticeable “bridge” between the stitches – that extra bit of thread causes more of a ruffle and can look confusing with the knots. In any case, sounds like a fun little leaf! I just wanted to thank you for your videos. They are so helpful. I was trying this stitch earlier from a really good book I own, but it just wasn’t quite right for some reason. I watched the video and I believe I can now do this stitch with confidence. Thanks Again! I am new but my goal is do a needlepoint and reaphoster a chair is this possible. Where would I find information could you help me? embroidery. Could you please advise me. salam .. hello marry ,, thankyou so much for such an interesting page and so use full . may god bless you for this . the videos doesn’t play here in our region ( they are on you tube. if yes ) the web site is banned in our country ,, can you plz favor us by uploading videos to your own page so that we can also watch and learn . Again thank you so much . I have just started 2 try 2 teach myself how 2 embroidery and if I hadn’t found your site on Pintrest I would have more than likely given up. Thank you very much 4 all of your help. I have your website saved 2 my home screen because I am constantly looking up a technique on how 2 do something.Again thank you so much !! Excellent designs!!! I am using these Embroidery for my Saree blouse. I’m new to embroidery and I found myself fascinated with this stitch, I wanted to know what kind of thread were you using? I simply use the commonly available anchor cotton thread here in India. Hi, Ananya – I’m using perle cotton #12 in the video, by DMC. Hope that helps!